We had the great honor to visit and speak last month at the PACER Center in Minneapolis, which advocates for children with disabilities and is recognized as a premier voice against bullying. It can only be described as an “awesome” experience. Aligning with the PACER Center is a natural fit for YCDC given our shared passion and goals. Just as YCDC is widely respected and lauded for its work to increase awareness and accurate scientific knowledge of dyslexia, PACER’s National Bullying Prevention Center is leading the fight against bullying through advocacy and critical resources. Bullying intersects with dyslexia particularly in school settings where far too often dyslexia is not identified, the word, dyslexia, not used, and the associated symptoms not addressed. As a consequence, dyslexic children when asked to read aloud in class are shamed and embarrassed. This frequently leads to bullying. In fact, we have met far too many dyslexic boys and girls who are victims of bullying. We are buoyed by the potential positive impact on both dyslexia and bullying prevention emerging from joint initiatives by YCDC and the PACER Center. Consider this definition of bullying: “When someone tries to make you feel less about who you are as a person, and you aren’t able to make it stop.” We thought of how applicable that statement is to the many boys and girls with dyslexia we have come to know. Now is the time for those fighting bullying to join forces with those of us working to support dyslexic individuals. This month at the PACER Center that happened in a big way. Sally Shaywitz, M.D. 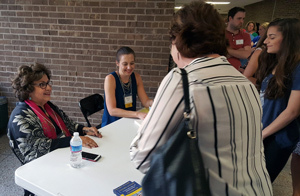 chats with visitors at the PACER Center who lined up for a book signing of Overcoming Dyslexia. We took advantage of the large crowd, including a great number who had traveled far distances, to convey the most important scientific knowledge and policy updates about dyslexia, including the unanimous passage of the bipartisan Senate Resolution 576 that provides a cutting-edge 21st century definition of dyslexia. We were excited to share data validating that dyslexia is an “unexpected” difficulty in reading; that is, in dyslexia an individual often has lower reading scores in contrast to his or her higher level of intelligence. As noted in our Senate testimony, we emphasized that with dyslexia there is an action gap—not a knowledge gap: We have a great deal of scientific knowledge about dyslexia that sadly is not being put into action. Determined to bring 21st century scientific knowledge to education, we presented key data showing that the achievement gap is already present in 1st grade! 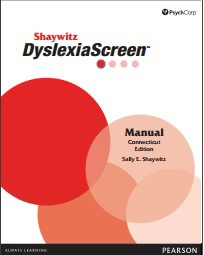 We noted that this finding inspired us to develop a new evidence-based screening instrument for kindergarteners and first graders—the Shaywitz DyslexiaScreen™. The screening is completed on an iPad by the child’s teacher and offers an immediate determination of whether the child is at-risk for dyslexia. We stressed that given the profound impact and prevalence of dyslexia (one in five people are dyslexic), it is critical that children are identified early, know their condition has a name and develop self-awareness about what dyslexia is. They should know that the reality of dyslexia is further confirmed by brain imaging studies revealing the neural signature of dyslexia. Combatting potential bullying starts by ensuring that dyslexic children are screened for dyslexia early, are diagnosed early and receive early evidence-based intervention and know that they, too, are part of a community of bright boys and girls who are dyslexic. Finally, we emphasized that dyslexia is a paradox illustrated by the Sea of Strengths. We provided examples of slow readers who often are also out-of-the-box fast thinkers. The audience response sent a powerful message. The overflow crowd listened eagerly, nodded in agreement and didn’t move from their seats until the last question was completed and the lights dimmed. The appreciation was evident in the hugs, personal exchanges, and deeply felt “thank-you’s” expressed by so many, including a little girl named Aria for whom Sally had earlier signed a book. Aria came up to us and handed Sally a picture she had just drawn labelled “Dr. Shaywitz.” On the other side, written in a large determined print were the words “thank you.” We thank you, Aria, your mom who brought you to the talk and to the wonderful attendees and the PACER team who made this extraordinary event possible. 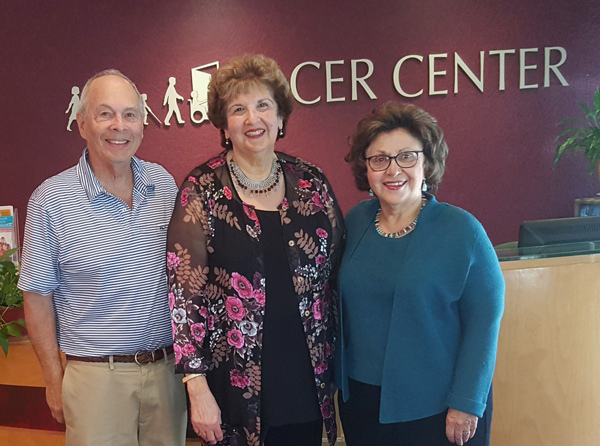 We very much look forward to continuing and growing the Yale Center for Dyslexia & Creativity relationship with the PACER Center.